SINGAPORE - A burst of colour erupts as children slide down the 32m-long ‘High Adventure Roller Slide’, housed in the new Admiralty Park, the biggest park in northern Singapore. It is equipped with colourful motion-sensor LED lights at both sides, and will shine brightly from 7pm to 11pm each night. This is one of the 26 new slides at the three new play areas - the Adventure, Family and Junior Areas - unveiled at the opening of the 7-ha urban area of Admiralty Park on Saturday morning (Oct 28). Guest of honour Mr Lawrence Wong, Minister for National Development and Second Minister for Finance, launched the park and said the NParks has redeveloped it in line with Singapore's 'Garden City' vision since 1967, as introduced by the late Prime Minister Lee Kuan Yew. "We've come a long way in building our 'Garden City'. Today, we have an extensive network of green spaces... 80 per cent of our residents live within a 10-minute walk of a park, we will increase the percentage to 90 per cent," Mr Wong said. He also announced that a 20-ha nature area of Admiralty Park will open in December this year. It will feature a new viewing platform and mangrove boardwalk to bring visitors closer to nature. NParks also previously sought around 4,000 suggestions from residents on ideas to improve their parks, and spent around $13.5 million on Admiralty Park's urban areas. Most residents in the neighbourhood requested more family bonding spaces while also retaining the natural greenery of the park. 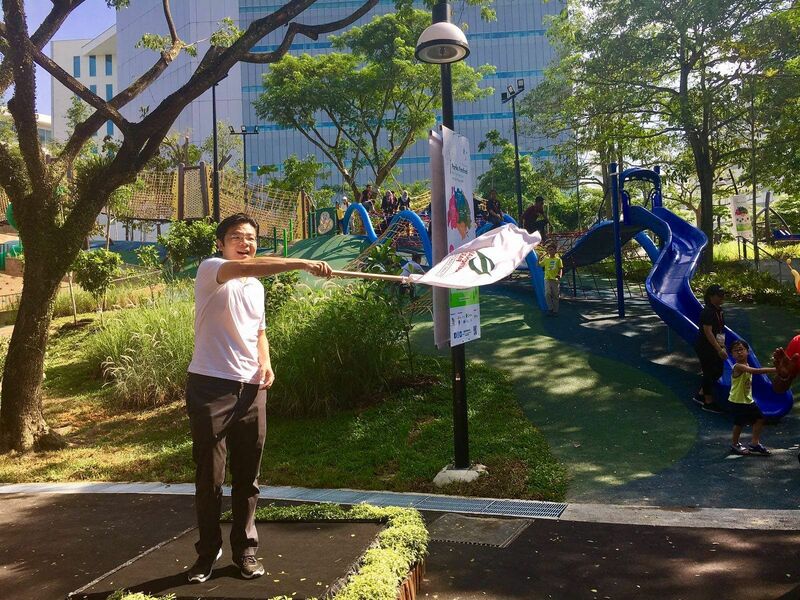 The current facilities and play areas have garnered positive feedback from residents and passers-by alike. "I saw it on the banners around the neighbourhood and so (my family) couldn't wait to come down for ourselves," said 43-year-old housewife Yuki Kudo, who visited the opening with her husband Shige Kudo and their three-year-old daughter and six-year-old son. The Japanese family are residents of Admiralty, so the park is a "convenient new addition to our neighbourhood", Mrs Kudo added. Mr Kudo said that the inclusive facilities at the park, like the wheelchair swing and inclusive merry-go-round, were notable and noble additions. "It's good that children with or without disabilities can play together and observe each other," he said. This is in line with NPark's initiative to encourage more diverse and inclusive play areas for children of all ages and abilities. Mrs Shanthi Bala brought her 14-year-old son Parath Bala to the wheelchair swing to play. "Parath has epilepsy, so he is wheelchair-bound and cannot walk yet. Swings like this are very fun for him, and he clapped a lot when he was on it. It's easy and not too heavy for me to swing it either," the 36-year-old said. Admiralty Park was officially opened in conjunction with NPark's second annual Parks Festival this weekend (Oct 28-29) at parks in Singapore, including Bishan Ang-Mo Kio Park, Pasir Ris Park, Esplanade Park and Jurong Central Park. Festival activities like balloon sculpting, mass Zumba classes and street performances by acrobatic duo The Annoying Brothers took place in Admiralty Park. Meanwhile, Jurong Central Park will host this year's 'Rockestra', featuring a night of Mandarin and Cantonese pop hits this evening.